Packraft – a small inflatable raft/boat that when deflated can be rolled/folded and carried in your rucksack. Weighing around 3kg and packing down to the size of a small tent they can be inflated in a few minutes and are surprisingly robust. Check out how easy it is to inflate a packraft in my video here. With packraft, a PFD (portable flotation device) and paddle you will be adding around 4.5-5kg to your pack, but a few extra kilos can add up to much more adventure and fun. And the extra kilos can be put to multi-purpose use – an inflatable PFD can double as a pillow, an extendable paddle can be used as a pole for your shelter and a deflated packraft makes a handy groundsheet, or inflated can even be a comfy bed. 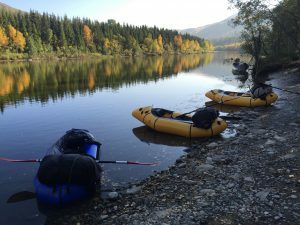 Hiking with a packraft can open up new and extended travel/route opportunities particularly in more remote wilderness areas. With a packraft the ability to cross, traverse or follow lakes and rivers suddenly makes you look at routes in a new light. Major water features such as rivers, lakes and lochs which are often a natural barrier when planning routes on foot can now be an inclusive part of your route. 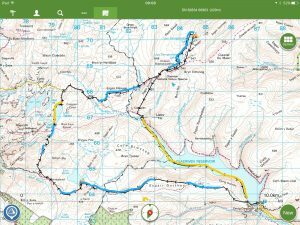 A classic example in the UK would be north-west Scotland – Assynt in particular- where on a map the terrain is riddled with lochs and rivers, limiting cross-country hiking, or involving lengthy detours. A packraft, however means you can embrace the blue bits be it either crossing rivers, traversing lochs, cruising rivers. A typical looped route may involve hiking out and using a water-course, typically a river, to assist the return leg, or a cross-country route may mix-match mountains/lake/rivers combined with hiking to traverse terrain that would be otherwise impractical on foot, as per our Lapland trip. Others have taken packrafting further to the point that the packrafting is the main focus of a route, including white-water river runs (packrafts are surprisingly robust!). 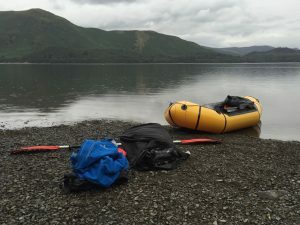 In the UK, particularly England and Wales, there are restrictions on rights of access on many rivers and lakes though outside of the Elan Valley, Mid-Wales and the Lake District the scope for hiking/packraft routes is more limited in any case. Scotland however offers a ‘raft’ of opportunities from large lochs, longer rivers runs and white-water for the more adventurous. To find out what you need to get started packrafting check out my packrafting gear page here.